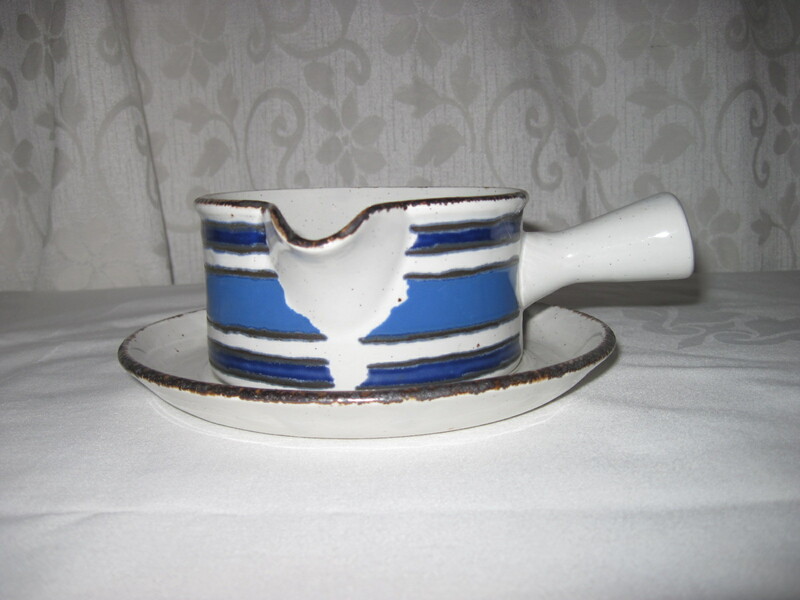 Continuing with the blue theme, this is a gravy boat and underplate by Midwinter in the Stonehenge Moon Pattern. Stonehenge patterns were released in 1972 and Midwinter put out dishes in the Stonehenge pattern in yellow (Sun), reds and browns (Earth) and the above blue colour (Moon) in 1973. They were designed by Eve Midwinter. The background is an oatmeal coloured speckled glaze and the dishes were finished with hand applied iron oxide banding to the edges. They were meant to look rustic and this was quite the in look back in the 70’s. This will be for sale soon at my booth in the Almonte Antique Market, Almonte ON. for $20.00.